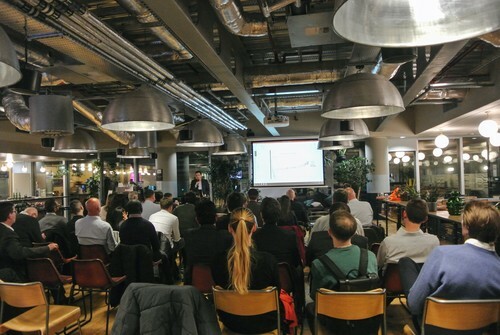 On Wednesday Orbis hosted their first event of the year. As with all events there’s a hidden mix of excitement and anxiety, but luckily this event exceeded expectations. Incorporating some of the best experts in the market, to discuss the integration of AI into the workplace and creating adaptive workflows. 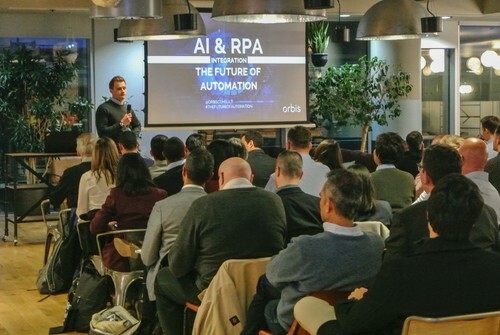 AI is a hot topic, and we wanted to discuss how this pioneering aspect of the corporate environment can be implemented and the limitless abilities to automate various tasks, data and decision making. Ever evolving and reaching new heights, there’s a lot of potential for introducing these AI tools into our work, equipping employees rather than creating job displacement. 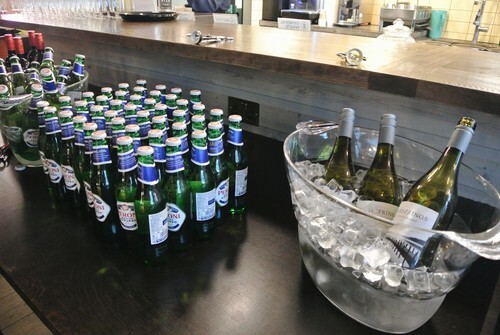 It was a fantastic evening with lots of beer, pizza and interesting engagement with international speakers. To kick things off, Arif Khan - UiPath spoke to us about automating tasks and data-driven decision making. He discussed how their services save 700-man hours a month, the difference between RPA and machine learning, and how AI sits in between. UiPath is a unicorn firm which has grown from a 300-person organisation, up to 2,500 – clearly displaying how popular this space is. Arif is an AI SME with 15 years of IT transformation experience across multiple industries, with a specialisation in Capital Markets. Arif is currently a Customer Success Manager at UiPath, working with clients to maximise the benefits of their investments in automation technologies. 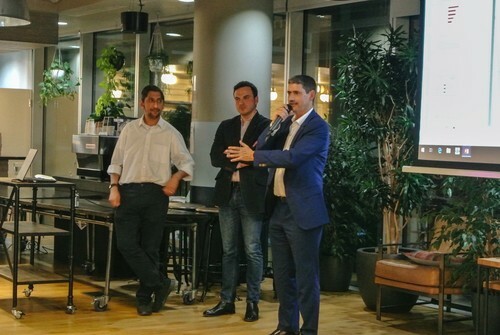 Prior to UiPath Arif built & led the UK Machine Learning & AI Practice at Capco, a global Consultancy focused on financial services, defining and delivering innovative solutions for clients utilising ML and AI products and techniques. Arif has a passion for combing the Agile delivery of projects along with his interest in AI, ML and RPA to solve real business problems effectively and quickly. Arif is a member of the Institute for Robotic Process Automation & AI . Arif has an MSci in Computer Science from University College London, specialising in Artificial Intelligence and Machine Learning. Followed by João Pires Da Cruz. He demonstrated how using AI can improve efficiency in various workflows. Today we have plenty of applications harnessing automation across the world, instead of monitoring employees workload and estimating the time it takes for them to complete duties, we can instead retrieve a full analysis of each task, the accurate time taken and bottlenecks. Ultimately, ask why is it a human doing that, why is it not a bot? João co-founded Closer 13 years ago, a company that grew from 2 to 200 employees with the mission “To Challenge Complexity”. With a PhD in Physics, João has worked within data organizations for 25+ years and understands the relation between data and the limitations induced by the set of mechanisms that produce it. Alexander Denev finished up the talk by discussing applications in enterprise. Alex has more than 15 years of experience in finance, financial modelling and machine learning and former Head of Quantitative Research & Advanced Analytics at IHS Markit. He has written several papers and two books on topics ranging from stress testing and scenario analysis to asset allocation. Alex is currently writing his third book which will be on Alternative Data and advising start-ups on analytics. 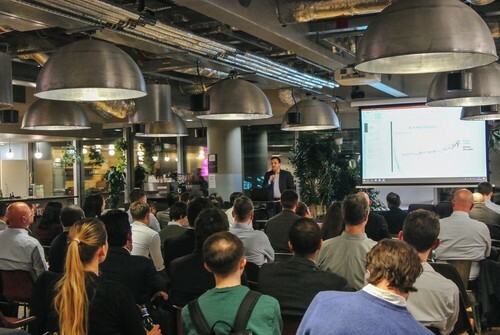 We finished up the night with an engaging group Q&A session, from debating the integration of automated workflows into smaller business’, decision making for finance loans, health tech and much more. 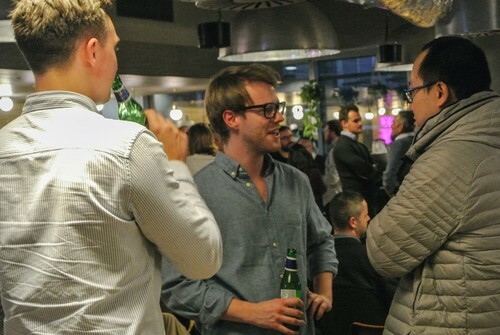 Some great connections were formed, and it was a shame to draw the night to a close – the beer taps could have kept flowing. A big special thanks goes out to WeWork for allowing us to use the space and for helping with the set up of the event. 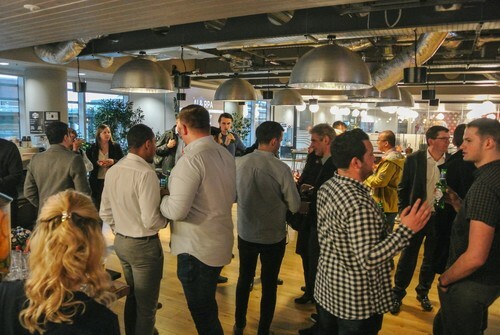 Not only do we value the interaction with our community of friends, clients, candidates and contacts, these events are a valuable resource of ideas and information and we love to play a key part in that. We are so grateful to have received fantastic feedback from all the attendees. We’re looking forward to hosting our next event and connecting the innovative expertise in this exciting industry. So, who’s coming to the next one?